How do I install the Virtual Desktop Service on to a tablet? 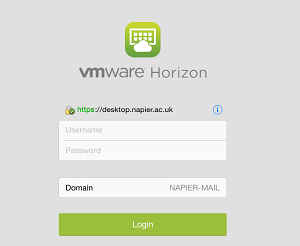 How do I install the Virtual Desktop Service on to a PC, laptop or tablet with no VMWare Horizon client available? When you successfully logon you will see all virtual desktops available to you, select the required desktop. Your virtual desktop will open. Once finished remember to log off via the Virtual Desktop Start menu. Posted - Tue, May 31, 2016 12:22 PM. This article has been viewed 20959 times. How do I install the Virtual Desktop Service on to a PC, laptop or tablet? Can I print using the Virtual Desktop Service? What is the Virtual Desktop Service? Can I use sound via the Virtual Desktop Service? What is the minimum specification for installation of the VDS client?